Hello guys! Hope you’re well and eating good! Christmas is literally around the corner so I hope you’ve been sipping that mulled wine! (I know I have). So today’s recipe is a sweet one! I know I don’t show you guys much of my baking skills but I promise I do have them ! lmao. 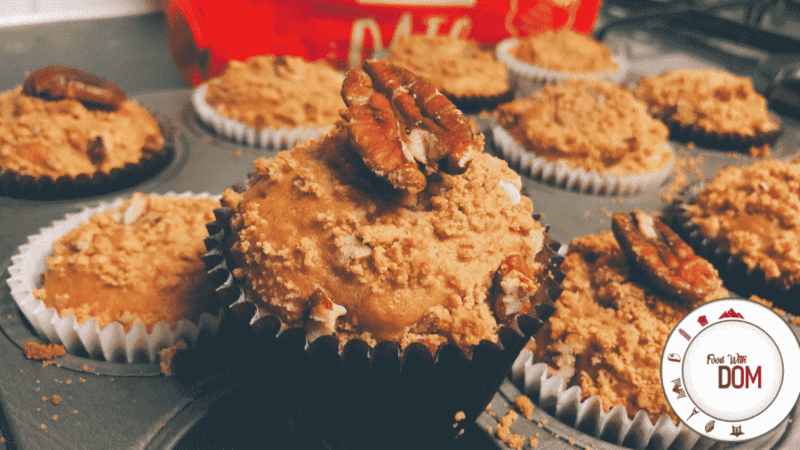 Anyway these Pecan crumble muffins are delicious and although I don’t really like cake (yeah yeah I know, you don’t eat cake!??) so this one is really just cause of you guys . I tried some of the cruchy topping part and it was delicious. I added some nutmeg and cinnamon into mine, also some pecans. You don’t have to do this but I like the nutty taste it gives. Feel free to go wild as I try to tell you with all my recipes, poppy seeds, lemon, orange, chocolate chips, it’s up to you! The oatmeal I used is from Prozis (Click the link to purchase a 1250g bag for less than £4!) The oatmeal is quite fine so it works well as half and half with flour. Alternatively you could grind rolled oats into a powder with a food processor or coffee grinder. Next add in all the wet ingredients (eggs,oil, sugar, extract) and mix until evenly combined. Place the mix into buttered and floured muffin tins or into muffin cases. Equally spoon the crumble over the batter and be generous! Check them between this time but poking the centre of a muffin with a skewer, if the skewer comes out dry, its ready!